Apple Butter is common throughout Eastern Europe. With only three ingredients in the recipe -- apples, water, and sugar -- it was an easy project for an overabundance of fruit. Today, we have microwaves and slow cookers that take the drudgery out of keeping a watchful eye on the pot. This recipe easily can be increased. 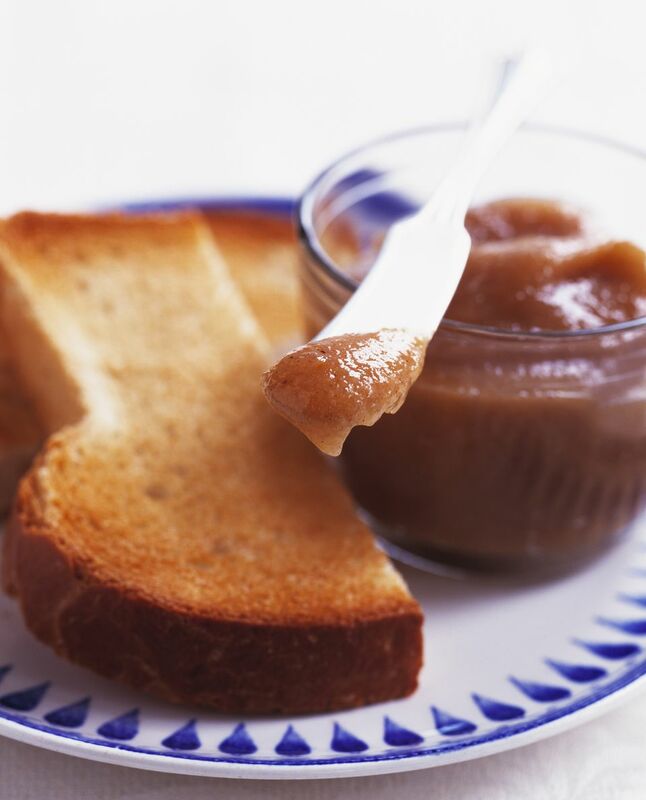 It's low in sugar, as all fruit butters are, and makes a great topping for breads, rolls, ice cream and cakes. In a medium saucepan, combine apples and water. Bring to a boil, reduce heat to low, and simmer until apples look like applesauce, stirring occasionally. Pass the puree through a sieve or food mill. Mix the strained puree with the sugar and spices and choose one of the following cooking methods. Place sweetened pulp in a slow cooker with the lid partially off to let steam escape. Set at low and cook, stirring occasionally, for 6 to 12 hours or overnight, until thick enough so the butter doesn't run off a spoon when turned upside down. Place sweetened pulp in a microwave-safe bowl and cook for 20 minutes at a time. Stir frequently until thick enough so the butter doesn't run off a spoon when turned upside down. Place sweetened pulp in a medium saucepan and cook over medium-low heat. Stir frequently, for 1 to 2 hours or until thick enough so the butter doesn't run off a spoon when turned upside down. Place sweetened pulp in a heatproof casserole dish or roaster. Bake, stirring only occasionally, for 1 to 3 hours or until thick enough so the butter doesn't run off a spoon when turned upside down. Place hot butter in hot sterilized jars, leaving 1/4-inch headspace. Cover with hot sterilized lids and rings. Remove to counter and allow to cool before storing in a cool, dry, dark place.